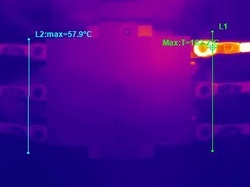 Thermal Imaging is the leading non-destructive testing tool used in elrctrical switchboard maintenance and switchgear maintenance. It is an excellent fire prevention tool used to identify 'hot joints' invisible to the human eye. It is an essential part of every commercial and industrial business’s preventative maintenance plan. This extreme fault was picked up during a routine scan. Fire danger was extreme causing an immediate shut-down of the plant. 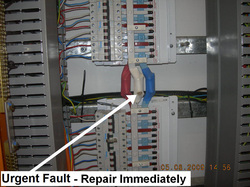 Fuse links and Power Factor Correction units are the most common electrical fault we find in manufacturing plants, hi-rise buildings and hotels. 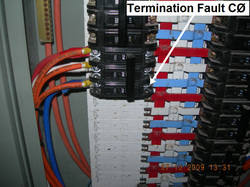 The following is a fault found in a Power Factor Correction unit. 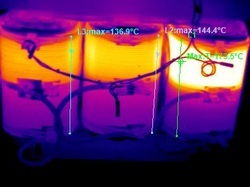 Smaller faults develop without your knowledge Thermal Imaging will find fire danger. The following steel plate was installed in a switchgear cubicle. 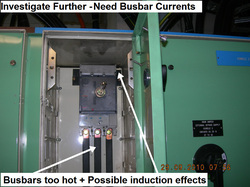 Hysteresis / Eddy current losses resulted in local heating. It was recomended the steel plate be replaced by stainless steel. 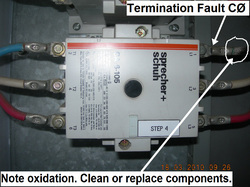 Complacency and bad OH&S procedure are the number 1 cause of fire. It is imperative to scan your plant annually. 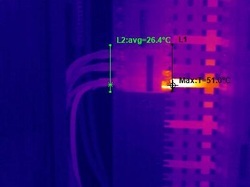 You cannot see the overheating transformer coils, but Thermal Imaging picked up these under-rated / overloaded transformers. All of the embedded temperature sensors had failed leading to fire danger, and costly downtime. 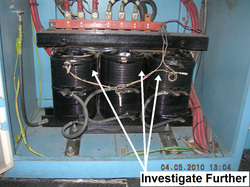 Thermal Imaging predicted early failure of this air cooled transformer, preventing lift failure in a high rise building. 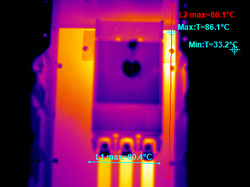 Thermal Imaging can pick up overheating motor bearings and other mechanical equipment.